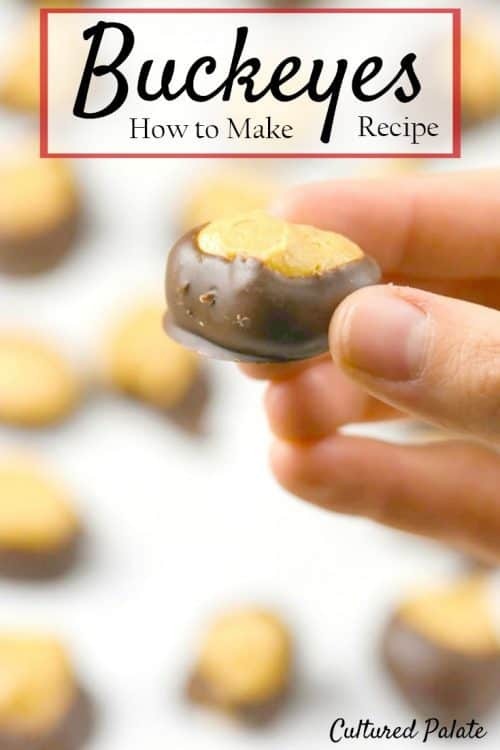 Have you ever wondered how to make buckeyes! 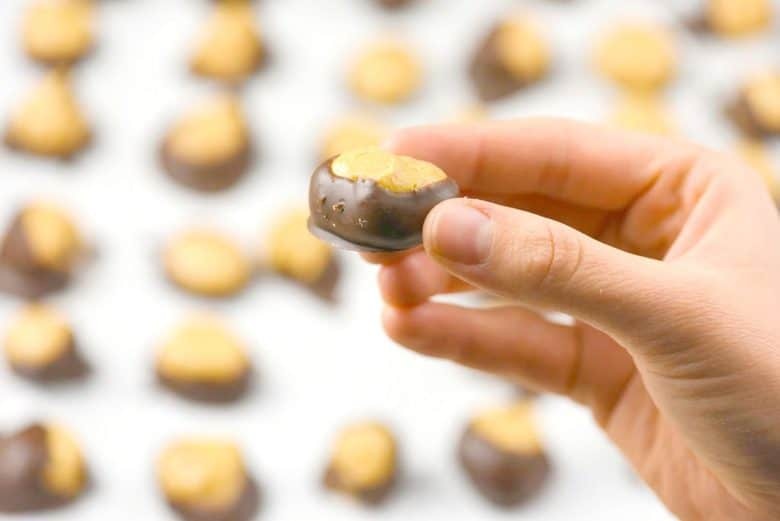 With this buckeyes recipe, they are so much fun to make but, they are even more fun to eat! Made with peanut butter and chocolate how could these not taste good?! We are watching our 2 year old grandson for the next few days and boy are we having fun! Since this is the first time his parents have left him, we are all doing our best to distract him and keep him happy. 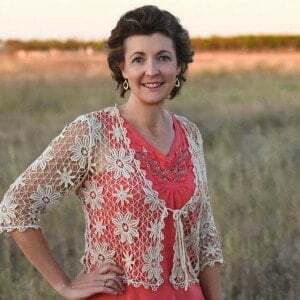 With 2 grandparents, 2 aunts and 4 uncles – it is not hard! One of the activities we are doing is Christmas baking and one of the cookies we are making is Buckeyes using the Buckeyes recipe from John’s mom. Don’t get me wrong – he is easy to entertain. With so many of us it is definitely not hard at all. In fact, he fits right in and loves playing with his 8 yr old aunt and older uncles. Its hard to believe there is only 6 years difference between him and our youngest! He is such a little helper and loves being in the kitchen. Maybe we have an up and coming chef in the family! Buckeyes always reminds me of eating Reese’s Peanut Butter Cups except that there are no unnecessary ingredients or preservatives. 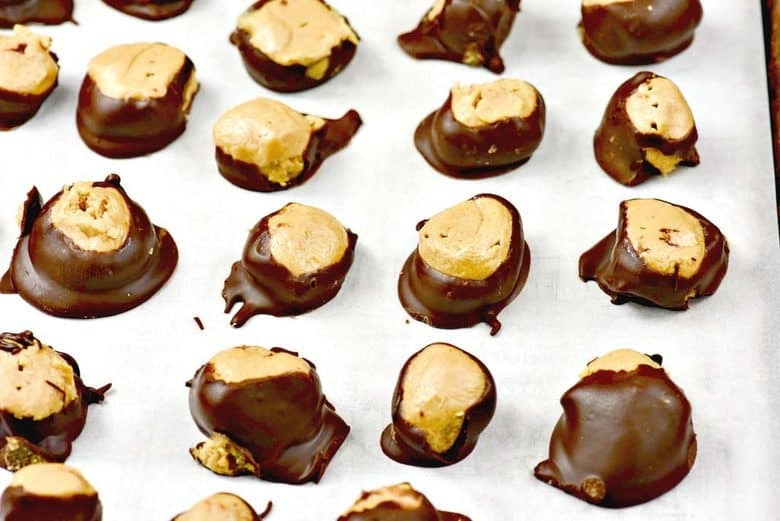 This Buckeyes recipe can be made more healthy by using fresh ground peanut butter but if you want a sweeter, closer to Reese’s Cup version, use regular ol’ peanut butter. This Buckeyes recipe is from my mother-in-law and was a tradition in their home just like it has become in ours. While everyone enjoys making them, the real treat comes from eating them! How To Make Buckeyes – Buckeyes Recipe Tips! It only takes about 20 minutes of hands on time to make this super easy treat but do allow for refrigerator time. After you roll the peanut butter into balls, put them back on the cookie sheet and in the refrigerator. It takes about 15 minutes for them to harden. After dipping them in chocolate, let them harden for about 15 minutes in the refrigerator. To dip the peanut butter balls in chocolate you can use a toothpick OR you can hold them with your fingers. When using your fingers you get to lick them when your done;) I bet you can guess which is our chosen method! This is a fun recipe to make and I hope your family will enjoy making these buckeyes as much as mine! 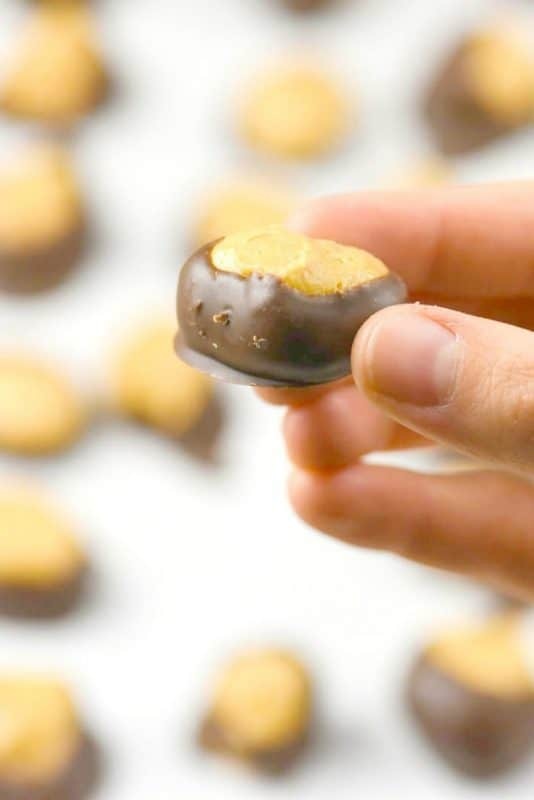 If you’ve tried this Buckeyes Recipe and tutorial for how to make buckeyes or any other recipe on Cultured Palate please take a minute to rate the recipe and leave a comment letting me know how you liked it. I love hearing from you! You can also FOLLOW ME on PINTEREST, FACEBOOK, INSTAGRAM, YouTube and TWITTER. A tradition in my home for the holidays. Are they yours? Beat peanut butter and butter until creamy. Beat in powdered sugar until the mixture holds together and is moistened. Shape into 1 inch balls, place on baking sheets and place in the refrigerator. Allow to harden for about 15 minutes. Melt chocolate chips in the microwave for 1 minute. Dip each peanut butter ball into the melted chocolate. Place the Buckeyes back on the baking sheet and place baking sheet in the refrigerator until the chocolate is set (about 15 minutes). How to make buckeyes - tips! Our family loves Buckeyes! I have my mother-in-law’s recipe too. It’s pretty much the same as yours. A few years ago I decided to invest in a small chocolate temperer, so I now use couverture chocolate, but other than that the peanut butter part is the same. The only problem with the temperer is that now we make a lot more chocolates! At least they make good gifts! Gay, I just found a recipe to temper chocolate and we plan to try it on turtles! I can see where that would be hazard though for my waistline!!! Peanut butter and chocolate is the best combo ever, I’d be addicted to these! buckeyes are a classic combo! Thanks for inspiring me! Tessa, you are welcome and I hope you enjoy these traditional holiday treats!